While the DJ technology scene rampages onwards, the headphone market remains largely unaffected by such things. MIDI headphones? Not likely mate. So it gives me great joy to cast my eye over a product group that doesn't require software installation or troubleshooting - they are what they are and not likely to change anytime soon. 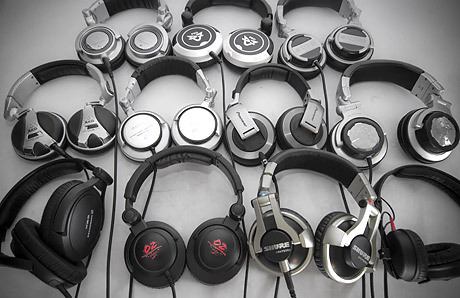 It's been sometime since we had a headphone roundup on skratchworx - well over 5 years in fact. And while there are some familiar and dependable products crossing over from last time, I've tried to assemble the cream of the current crop, even if it meant pulling in demo units from retailers (Panasonic couldn't supply Technics cans and 3 attempts to get Sony cans fell on deaf marketing ears). Undaunted, I felt that they should still be in the test as they're still relevant as respected products, and also make good yardsticks for comparison. This time around, I'll be approaching the review in a slightly different way. Instead of individual rating for each and every feature, I've broken down the essential characteristics of headphones and will attempt to tell you which I feel is best and worst in that section. As ever, it's opinion rather than arbitrary numbers that count on skratchworx. And at the end of it all, I'll break down the ones I call my favourites and the things I like about them. I won't be telling which ones are the best as that's for you to decide. I'll simply present the facts as I see them and let you make a better informed decision. This covers the industry standards as well as bringing together the new jacks that you might consider in their place. But let's get one huge fact/disclaimer out of the way - sound is incredibly subjective, and one man's tinny noise is another man's aural pleasure. So I'm not going to get all flowery with the technical terms. I will however offer my opinion on if they sound good or bad. Remember, I'm reviewing these as battered and abused DJ headphones rather than cans for listening to the finest Jazz vinyl in a controlled audiophile environment.